I did not fully comprehend how much living in London would cost until I got over there, however I had enough savings to not stress about money, live comfortably and enjoy many travel opportunities. This should definitely be communicated to future exchange students, as I met other students who really limited their opportunities until the end before travelling because they were constantly budgeting. Throughout the semester I had time to travel to Iceland, Switzerland, Budapest, Prague, Vienna and Scotland. I did a few trips in England including Nottingham, Peterborough and Cambridge, although I regret not being organised enough to visit some other places. After my exams finished, my lease also finished and I begin a five-week solo travel experience across Europe. From London I travelled to Norway before visiting Copenhagen, Berlin, Munich, Innsbruck, Salzburg, Venice, Rome, Florence, Milan, Barcelona, Paris and Amsterdam. It was such an amazing experience I met lovely people in Hostels along the way and saw beautiful architecture, cities and natural landscapes. Travelling was definitely a highlight of my trip although it was lonely at times I made use of every opportunity and I was able to meet a friend made through the exchange program on my last stop in Amsterdam. City University was different from QUT in terms of diversity of culture; it was so refreshing to be in a country and university, embracing difference and acceptance. London is one of the most multicultural countries in the world, although I felt Australia was quite diverse, London was nowhere I had ever been, it was so exciting to be immersed in culture, language and practices. I was able to develop cultural awareness about different cultures through my classes and interactions with other students. My exchange experience has been a truly rewarding and memorable experience I will always cherish and would recommend it to any student at QUT. Two weeks in and I have now completed the International Business unit. If you are looking at doing International Business, I highly recommend it. Not only did I learn the basics of International Business but also information on trade economics, international marketing and international organisational structures. Thus covering many of the broader factors relevant for International Business. Ignoring the intensity of the course (cramming one semester into two weeks), the course was very interesting and will definitely assist with my future business endeavors. Further, having diversity of culture within the class, it made for greater insight into the workings of various countries and for interesting discussions. Smaller class sizes of 5-10 people also allowed the greater interaction between students but also greater teacher to student interaction. For me, this learning environment has been much more effective in ensuring I understand and know the content of the class and works much better for intensive study. 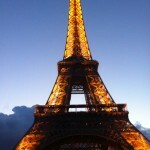 Spending a weekend in Paris with my school summer group was such a fantastic experience. A few of us rented a bike (free for each half hour increment) and traveled to all of the major monuments in Paris such as Notre Dame, Lourve, Arc de Triomphe, Champs-Elysees and Eiffel Tower (of course)! I also wanted to enhance the “French” stereotype so I got wine, baguettes and cheese and had a picnic under the Eiffel Tower (photo above of Eiffel Tower). I also took a trip to Chateau de Versailles. 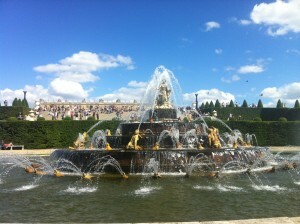 There I explored the amazing gardens and the house of Marie-Antoinette. Unfortunately, time did not allow for a visit through the Palace but I will be venturing back to see this in a few weeks. If you have a chance, I highly recommend the 45 minute trip from Paris to Versailles. So much history, beauty and amazing architecture. I will be sure to post again soon about the progress of my next subject, digital marketing and any other adventures I get up to. 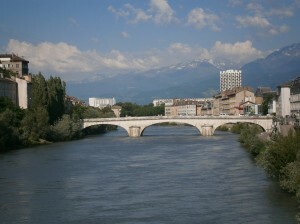 Wondering what students get up to on their weekends in Grenoble? 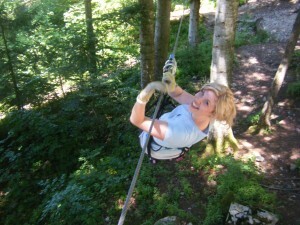 Well our University had planned a ropes course on the Saturday and a trip to Annecy, France on the Sunday. On Saturday, myself and the other students were full of adrenaline throughout the entirety of the ropes course largely due to the fact we were up in the treetops and crossing thin ropes and wires with obstacles in our way to make each area more challenging. To start, we completed the beginners course which I found quite easy (luckily). From there, I felt ready to face one of the harder coursers, the “red course”. After a few obstacles on the red course (climbing up a rope ladder and walking across a thin rope with not much to hold onto) I was exhausted and fear got the better of me. 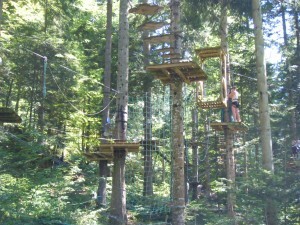 Worst problem was that I had to finish the course, as there was no other way down. By the end of the course though, I felt an overwhelming sense of accomplishment. I had just walked across and weaved my way through thin ropes and down big nets. The ropes course was a fantastic way of facing fears, experiencing a different type of challenge and receiving encouragement from fellow students. 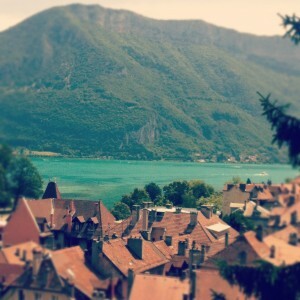 Today (Sunday, 24 June 2012), we took a trip to Annecy, which is about one and a half hours from Grenoble. Annecy is beautiful and I would describe it as being very colourful with the bright green mountains, blue rivers, bright coloured buildings and flowers everywhere. There are many tourists weaving through the streets, markets and little shops and enjoying the food of many restaurants. We got to explore the Annecy goal, explore the town and have lunch at a great little French style restaurant. Many of my classmates hired boats and went along the river as the rest of us wandered the streets. It was such a fantastic day and I would really recommend everyone to visit the beauty of Annecy. However, we are back at our residency now and after such a wonderful weekend, it is hard to get motivated to study. I do however, have to hit the books so it is goodbye for now. Hooray! Made it through the first week and what a good week it was. 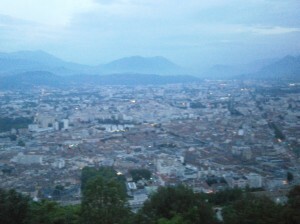 Grenoble is beautiful. Here, we are surrounded by the Rhone-Alps, the buzz of chatter and laughter, pure sunshine (although rain periods have also been experienced) and people out on their bikes or having a coffee at the cafe. The Grenoble lifestyle appears to be waking up late, food from the bakery, work from 10am till 7pm, two-hour lunch breaks and then out for dinner from 7:30pm. Finally, the sun decides to leave this place about 10-10:30pm and it is off to bed. My Grenoble lifestyle feels much like the locals. 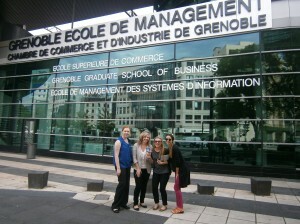 I grab my croissant and head off to the Grenoble Ecole de Management, for my subjects in International Business and French Language and Culture. I will admit the days are very intense. We learn the equivalent of three weeks of study at QUT in one full day. The classes are kept interesting though by incorporating current world trends and issues and with such diversity in the classes (students from India, Saudi Arabia, Syria and America), the similarities and differences between the countries are greatly emphasized in discussion. French Language and Culture is NOT about learning the language (which I assumed it was) but about French society, history, and places to visit within the country. We have also learnt some basic language phrases which have been useful for day-to-day. Evenings are spent taste testing the different meals, desserts and wines from various cafes/restaurants followed by some late night revision. 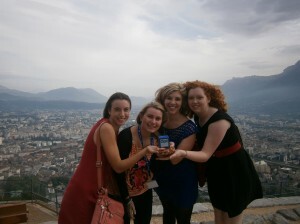 Two unforgettable moments of the week included the trip to La Bastille and the music festival. 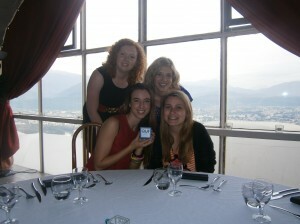 As a class, we took a cable-car over the roofs of Grenoble, over the Isere river and up to the top of La Bastille. 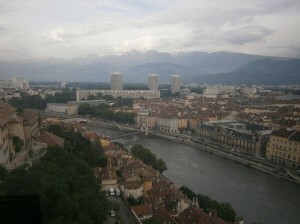 The views from above are spectacular, overlooking the entirety of Grenoble, the mountains and the rivers. The view plus a delicious three-course meal definitely made for a fantastic memory. Secondly, ‘La fête de la musique’ (music festival) was another highlight. To celebrate the longest day of the year, stages are setup around Grenoble with music from genres of pop, rock, electronic, hip-hop and classic blaring from them and children to adults dancing around the stages. Again as a class, we went around to each of the stages and enjoyed people watching and participating in the celebrations, which go well into the morning. To sum the week, it was fantastic. I have been able to meet new people from all different countries, expand my waistline with all the taste testing, explore the city of Grenoble and undertake studies in a new and interesting environment. For the weekend, we (the class) are off to Annecy for a ropes course and to explore the cute little town. Till next time…..